Enjoy the ambience of historic downtown Bozeman in this totally renovated two-bedroom, one-bath, loft. Located on the south side of Main Street, the 9’ arched windows and deck provide great views of the Bridger Mountains. You will be located in the heart of restaurants, galleries, shopping, and all that happens downtown while still being at the doorstep of Montana’s great outdoors. Your home away from home is beautifully appointed with stainless steel appliances and limestone/slate countertops used throughout the kitchen and bath. 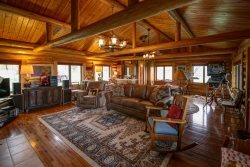 The living room has warm, cherry wood floors and a gas fireplace centered in the seating area. There is a dining table to seat six, and counter seating for four. The large desk with attached hutch houses a hi-tech stereo, which also functions as an on-the-go office. The master bedroom, with lovely arched windows overlooking Main Street, has a king-size bed with 300-thread count Egyptian cotton sheets. A wall-mounted TV is provided for your viewing pleasure. The second bedroom also has a king-size bed, making this loft perfect for a family or two couples. The bath has a tub/shower combo, a pedestal sink, toilet, double sets of towels, and a closet for plenty of storage. A full size stacking washer and dryer are located in the bathroom for your convenience. - Full kitchen with stainless steel appliances including a refrigerator (w/ice maker), dishwasher, range, and microwave. The kitchen is stocked with two sets of dishes, plenty of glass and silverware, coffee maker, blender, mix-master, toaster, and a complete set of bake and cookware and table linens. Joe's communication was prompt and efficient. We thoroughly enjoyed staying in Loft In The Rockies. The property was very well furnished with everything we needed and we liked being on Main Street because of the easy access to shops and restaurants. The loft was beautiful and the balcony was perfect for people watching and morning coffee! Centrally located and well appointed. We will be back! We came in to Bozeman for a long ski weekend while visiting our MSU student son. This flat is amazing!! Perfect size and the most amazing location...we had stayed at a hotel by the highway on previous visits...so sad that we didnt know about this place ...and now our son is going to graduate. Steps to dinner, breakfast, shops, pub crawl. The whole vibe of the flat matches the downtown vibe; historical, modern/rustic....clean and well appointed. We had a great stay visiting our son, skiing, entertaining in the flat one evening and then going out to the local establishments the next night. It was perfect!! We loved our stay at this gorgeous apartment. Will def stay again when we make it back out to bozeman. Great team and very responsive. It's fun to be right downtown, just steps away from the best shops and restaurants in Bozeman. It's also a quick trip to Bridger Bowl from the property. Fun to be downtown and a great loft! Very very nice and great location! We made the trip to Bozeman to visit sister's family and see a new nephew. Have never stayed on Main Street before. It was a trip. Lively and energetic at night. We loved the loft, perfect location downtown. Some folks commented noisy, it didn't bother us at all! Parking not so easy but it all worked out. Would recommend to anyone!!! Cheers. Great Place. Will certainly return. Clean, Comfortable and actually very quiet. Only draw back, which was not a big deal, is the entry is on main street. That makes it a little bit of a hike to haul items from back parking. We were here to see our daughter's first game game of her senior year as a MSU cheerleader for the Cats! We loved the loft and downtown. Whilst visiting plenty in the past this is our first time staying downtown and enjoying all it has to offer! The loft and staff were awesome! Just as the reviews and photos seemed. We will most certainly return! Thank you so much! Spike and Sam GO CATS! We really enjoyed our stay at this quaint apartment over Main Street. It is the perfect size for a party of 2-3 (two king beds), is furnished nicely and has a great balcony overlooking Main Street. It is situated in a perfect location on Main Street that is walking distance to numerous bars and restaurants. The interior of the apartment was very clean, comfortable and has a lot of natural light. We couldn't have asked for a better place to stay in Bozeman. Fantastic week in Bozeman, the apartment was perfect. Saw the sweet pea parade from our balcony! Great location, very comfortable apartment. Thanks for a great place with all the amenities and perfect location. We came for a wedding and can't wait to come back to Bozeman again. Came here for my daughter's wedding. Loved staying here at the "Lofts." So cozy, every amenity was here to make our week so comfortable. Enjoyed being right on Main St to enjoy restaurants, night life and bars. Will hopefully be back again!